Laser radars are single unit hand held devices. Some can be mounted to a tripod to make it easier to keep the narrow beam on target. Some models have an optional shoulder mount. Some units are designed like oversized binoculars. Most lidar manufacturers caution not to point the aperture directly at the sun. Direct sunlight has enough energy to cause damage by burning out the infrared detector diodes. Many lidars have a Timing Mode. The range between two points is measured and entered into the lidar. The operator pushes a button when a target passes between the two points and the lidar displays the calculated speed without ever transmitting. Laser radars have narrow beams on the order of 3 - 4 milliradians (mR), 0.17° - 0.23°. The narrow beam allows the operator to single out vehicles at relatively short ranges. Lidars also require the operator to precisely aim the laser at the same point on the target vehicle. In the figure and equation above, range and beam spread distance are in the same unit dimensions, feet, meters, etc. Laser radars are very selective at ranges less than 500 feet, beam spread is a couple of feet or less. 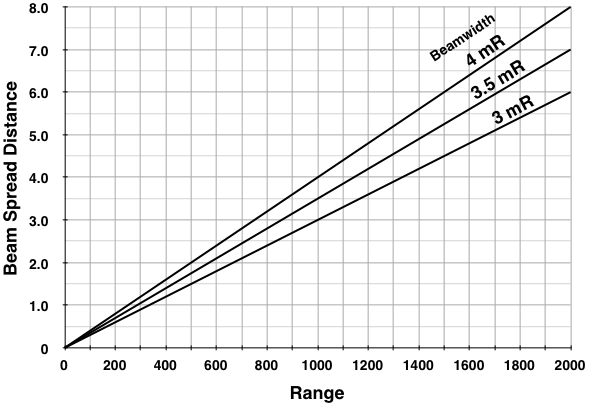 Over 500 feet the beam can reflect off of different parts, different ranges, of a target vehicle introducing errors. At 1000 feet the beam spread is 3 - 4 feet, wide enough to reflect off of other vehicles with just a little aim error. Snow and sleet reduce detection much like rain, the more water molecules the greater the reduction. Some lidar manuals suggest aiming the beam at the license plate for best performance. Maximum detection range is maybe a half mile in good weather. A vehicle can be made stealthy by removing the license plate and covering all chrome parts, headlights, tail lights, parking lights, and turn signal lights with black tape. Atmospheric conditions effect propagation and detection range. The best conditions for detection is an atmosphere that is cool, dry, and clear. Fog, rain, smoke, dust particles, carbon dioxide and water vapor reduce detection capability, sometimes to zero. Laser radars measure small range changes in short periods of time, this imposes tight tolerances on internal timing circuits. Aperture(s) to aim spot alignment is critical and also has very tight tolerances. The units should be tested by the operator before use. Check Lidar Calibrated. Most states require a lidar be tested by a certified shop periodically, typically once or twice a year. A sticker on the lidar, or records, should indicate last calibration test, next (due) test, and who tested. Run Lidar Self-Test. Self test should be run before, during, and after use. Check Beam Alignment. Lidar is swept pass a utility pole or a stop sign at 250 - 500 feet or greater. A range reading should only occur when object sweeps across the aim circle or crosshairs. Vertical and horizontal angles should be checked. Test Stationary Object Range. Lidar range measurement checked against a utility pole or stop sign of know distance, 250 - 500 feet or greater. Test Lidar against Vehicle of Known Speed. Test vehicle should have a calibrated speedometer. Best to run test at operational location. Tuning forks do not register speed on laser radar. External optical surfaces, aperture, aim scope or heads up display, should be periodically cleaned exactly as recommended by the manufacturer. Additionally all optical surfaces should be covered or capped when not in use to prevent damage. Scratches, pits, and stains in the aperture can degrade detection performance, beam direction and alignment to aiming device.